Those precocious neighbor kids from just down the street from my homeland in Ohio are back and, well, they have relocated from central Ohio to Philadelphia. I guess that they thought the cold wasn't damp enough. They have also now added the word Remember to their band name, I suppose that this makes them a little easier to Google. I mean, just try and Google "Sports" and see if you get anything at all about this band. And they are back with another record of catchy girl-fronted indie pop. It seems that the band is just getting better. Singer / songwriter / guitarist / band leader Carmen Perry is maturing into a talented songwriter, and the band backing her up do a really fine job. The record starts off with an organ drone and Perry singing in her quirky manner in Otherwise. The band comes in slowly, and then after a minute the whole things pops with fuzzy guitar and a nice energetic beat. This is a pretty good start to one of their records, lulling you into believing they are kind of a folk band and then suddenly dropping in with the catchy pop punk. And then they keep it up. Up From Below is fast jangly guitar and rhythm bouncing along. The song even has a bass solo courtesy of the only other original member left, Catherine Dwyer. Nice. You Can Have Alonetime When You’re Dead is one of the better song titles i have heard in a while. The song itself is pretty good, one guitar line clear and soaring while the other jangles through some fuzzy distortion as Dwyer keeps a sauntering bass beat. This reminds me of the late 1990s. A clattering drum machine beat and minimal guitar start off Dripping, with Perry singing a plaintive and cute song. For a minute, then the whole band hammers at it, a mid-tempoed chugging tune with fuzzy guitars and drummer Connor Perry apparently playing in a closet in a different building! The guitars jangle really happily here. On Calling Out, Remember Sports manage to channel the band that i consider to be the Platonic Form of punk pop indie rock: Superchunk. I think this is kind of what has appealed to me so much about the band: two guitars, a higher-pitched vocalist, and catchy rhythms that make we want to "pogo in my head". The elements are all there and on this song they fall into place, as drummer Connor Perry really channels Jon Wurster. Carmen Perry (any relation? i have no idea!) snarls her lyrics here: "And let's play another game of 'guess what i am thinking'!" Ouch. Carmen Perry and Jack Washburn really shine on the guitars on Nothing’s Coming Out a song that generally meanders along with some great whirring guitar. They follow this up with The 1 Bad Man, which starts with a Jim Wilbur guitar solo before heading into bouncing around territory. 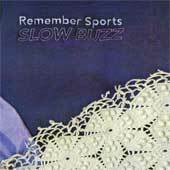 Way back when they were called Sports, back in 2013, when they had a different lineup (Carmen Perry and bassist Catherine Dwyer the only remnants of those hazy, central Ohio days), they released a self-titled EP. The centerpiece of that EP was a minute and a half blast of furious strumming and drum pounding, an old school punk tune called Temporary Tattoo, and they remake it here with a new lineup and five years of playing under the belts. It is obvious they still have fun with this, just tearing through the song with goofy punk ferocity. The clattering beat of Dripping meets that furious guitar of Temporary Tattoo to make Pull Through. This is a nice and poppy number where, when the music parts in the middle, you can hear the bass just swinging. Very nice. Perry sings a rather bleak song next, the messy and heartfelt No Going Back. Someone adds backing vocals, and there is a piano too, in order to make the song seem extra mournful. It's not bad though, just feels overly sad after the joyous punk of the rest of the record. They keep it sad for the remainder of the record, with Perry singing, "I'm playing dead inside" on Making It Right, and then singing "I didn't mean to be the hole in the crotch of your jeans" as a metaphor for causing someone else pain on the album closer Unwell. The melancholy works best on Unwell, as Remember Sports layer in a horn alongside the brushed drums and the sliding guitar. It is a sad, vaguely Western song that ends out the record. But they do it well. Those neighbor kids have done good!